So the weekend has been and gone. We had friends staying with us, so there was a certain amount of ‘entertaining’ – read into that, lots of food, and equally lots of drink. In fact we did very little this weekend apart from eat and drink! A couple of meals I’ll blog later this week, including a very yummy pudding. I’m getting very used to photographing everything I cook. I’ll be taking photos of my breakfast next, just out of habit. I’ve been doing a lot of reading up on how to photograph food, how to make it look more appetising, hoping it might help. I’ve advanced from my phone to the Husband’s fancy schmancy DSLR. He put it on a setting, told me I could make the backgrounds ‘fuzzy’ by twiddling a knob (ooh er), and let me go. Hopefully my photos have improved at least a smidge? I will add that the Husband is being very patient, considering he is having to wait some time to get his meals at the minute, some of which are a tad cooler than they would have been, had I not spent at least 5 minutes trying to get the ‘perfect’ shot. I’m telling him it’ll all be worth it when I’m making millions from the recipe books and tv deals :D.
So this carbonara is a major fixture in the HC house. It’s one of the few meals I know we can sit down to as a family, and everyone will eat. Clear plates all round. It’s a winner. It’s actually a Slimming World recipe I found years ago, thus it’s pretty low fat into the bargain. And it’s (honestly!) really quick and simple. 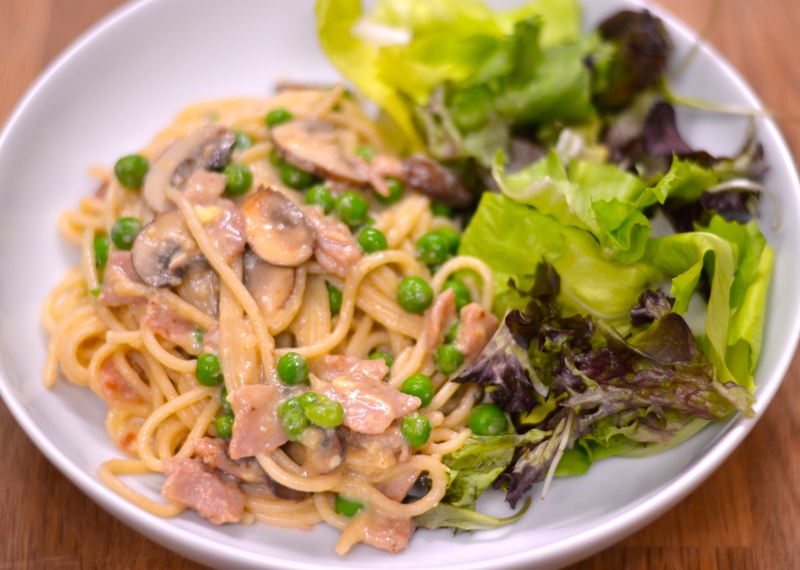 You can make it with as little as four ingredients – I used six as I love mushrooms and the kids love peas. Note: For pasta, I tend to use 50g per child, and 80g per adult. I find with this amount of spaghetti, the quantities above work for us. 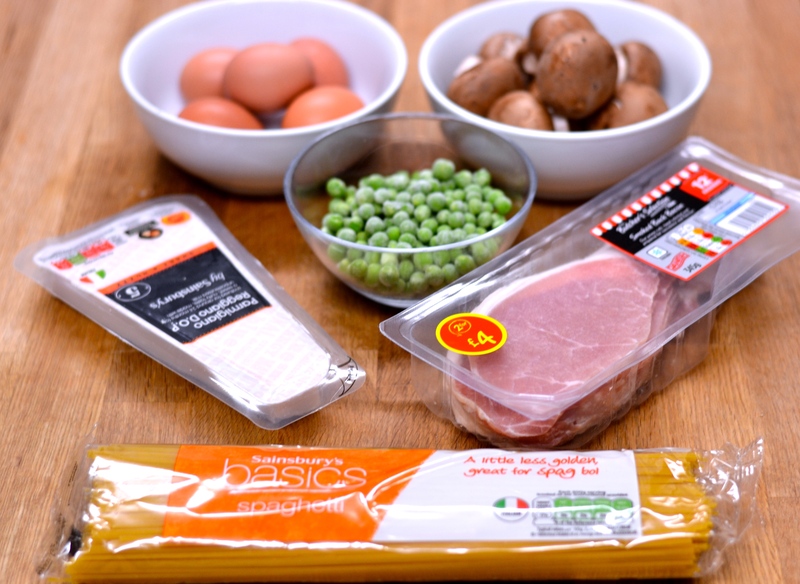 However, the bacon, cheese and veg (if using) are all flexible. Use as much or as little as you wish. I used 5 eggs as they were small, but for bigger eggs you’d get away with fewer (i.e. 3 large, 4 medium). 1. Boil the spaghetti in a large pan of salted water until it’s as soft as you like it. Right before you go to sieve/drain it, add the frozen peas (this stops them from overcooking and keeps them lovely and fresh). 2. 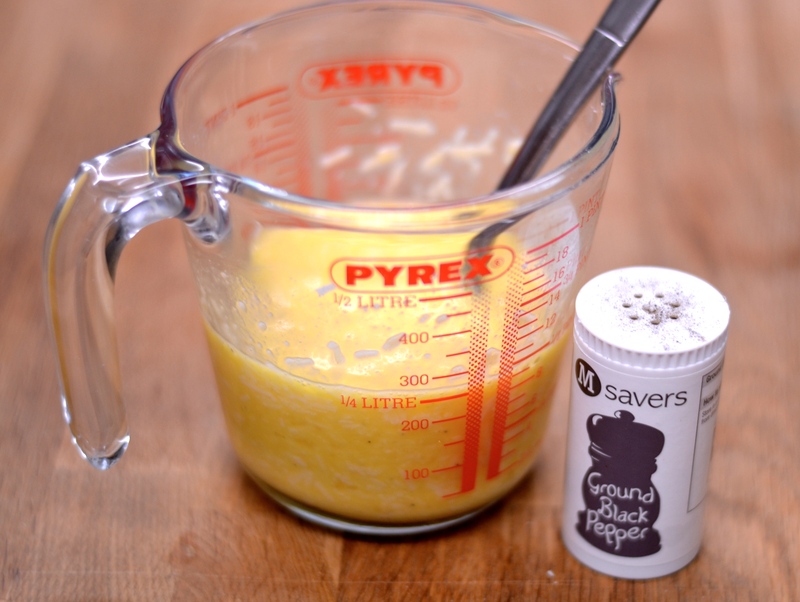 Whilst the pasta is cooking, break the eggs into a bowl/jug and whisk until mixed. Add the cheese and season as desired (I tend to only add a bit of pepper here as the bacon is pretty salty already). 3. Add a little oil to a wok/large pan and fry the bacon – I tend to use a wok as it holds everything once you’ve added in the spaghetti. 4. Add the mushrooms if using and fry until cooked/soft. 5. 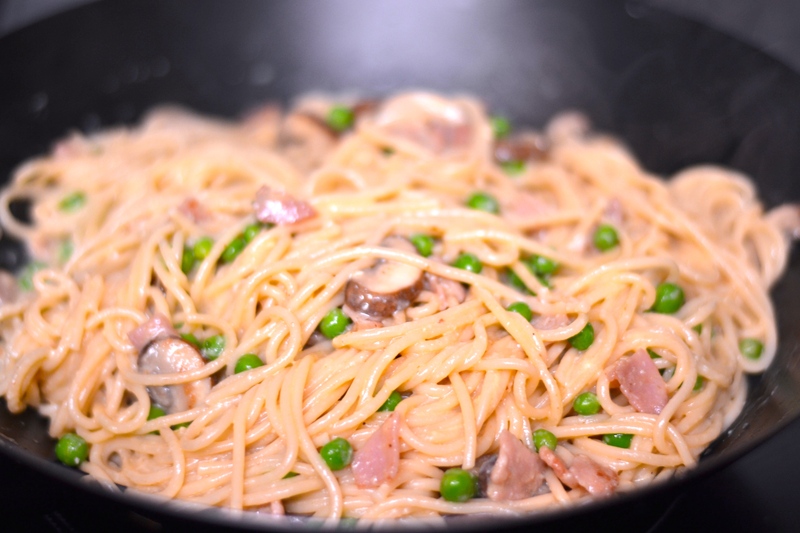 Once both the pasta and bacon/mushrooms are cooked, turn the heat off completely (both pans), sieve the pasta (with peas), and add it to your bacon. On top of that, chuck on the egg/cheese mix. 6. Stir this into the pasta, getting it all good and covered. This can be easier with a couple of forks. The egg mixture will cook, simply from the heat of the pasta. Note: if you’re using an issue military cooker, remove the wok/pan completely from the ring you were using, as it’ll still be hotter than the sun and might scramble the egg. If you’re a creamy carbonara lover, this may not be quite to your taste (although I guess you could throw some cream into the egg/cheese mixture before you chuck it on the pasta). But if you’re after a lighter version, one that is lovely and cheesy, but not blatantly trying to clog your arteries, then this could be for you. I’m sold, mainly because my kids devour it and look for more. That’s good enough for me.